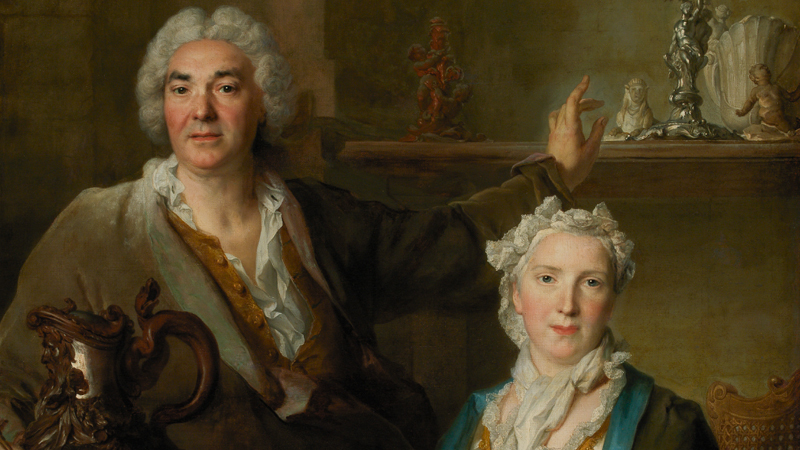 "Portrait of Thomas Germain and His Wife"
The portrait of Thomas Germain (1673-1748) with his wife, Anne-Denise Gauchelet, painted by Nicolas Largillierre, portrays King Louis XV of France’s famous goldsmith inside his workshop. The shelf to which he is pointing displays several models which were used as patterns for pieces of goldsmithery designed by the artist and much reused by his son, François-Thomas (1726-1791), in the adornment of sumptuous tableware for the European courts including Russia and Portugal. The only object in its final version, in silver, is a candlestick, which remains to this day in a private collection. This served as the basis for the silver tableware of King José of Portugal’s tableware, delivered to Lisbon by François-Thomas in 1757, and which is now displayed in the MNAA (Room 69).